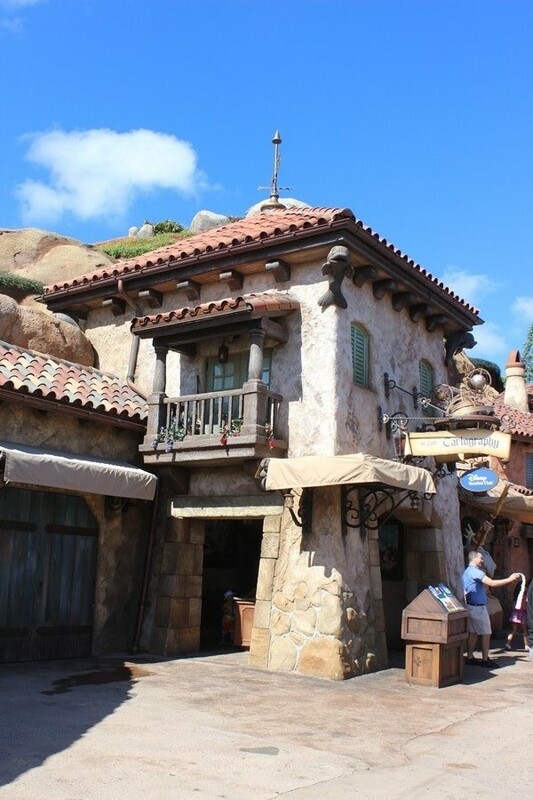 Tucked away along the backside of the Seven Dwarfs Mine Train rolling hillside, in the seaside village of Ariel and Prince Eric, sits a selection of merchant shops. Woodcarvers and provision providers can be found among the business residents. Perhaps most importantly to those setting sail for distant, and conceivably unknown, ports of call would be the cartographer. It just so happens that there is one in town who has his shingle out, and his name is H. Goff. While this may be the fictitious home utilized to house New Fantasyland’s DVC kiosk, there is much more to the story here. This sign pays respect to one of the grandfathers of Imagineering, Harper Goff. One of the designers who dreamed up Disneyland and then made that dream a reality, Goff found a home quickly at Disney in the early 1950s. He was the banjo-man for the Firehouse Five Plus Two, a train enthusiast, and an eye for art that immersed viewers into the world he had created. All of this is well and good, you might be telling yourself, but what does it have to do with New Fantasyland? Let’s take a closer look around. Goff’s shopfront is in a seashore area of New Fantasyland, where The Little Mermaid has made a name for herself. Long before Ariel, Sebastian, Flounder and their crew made a name for themselves, Disney had another bona fide hit from the ocean realm. 20,000 Leagues Under the Sea, the 1954 live-action film featuring Kirk Douglas and James Mason, had once enthralled audiences with its daring adventures and monstrous squid. 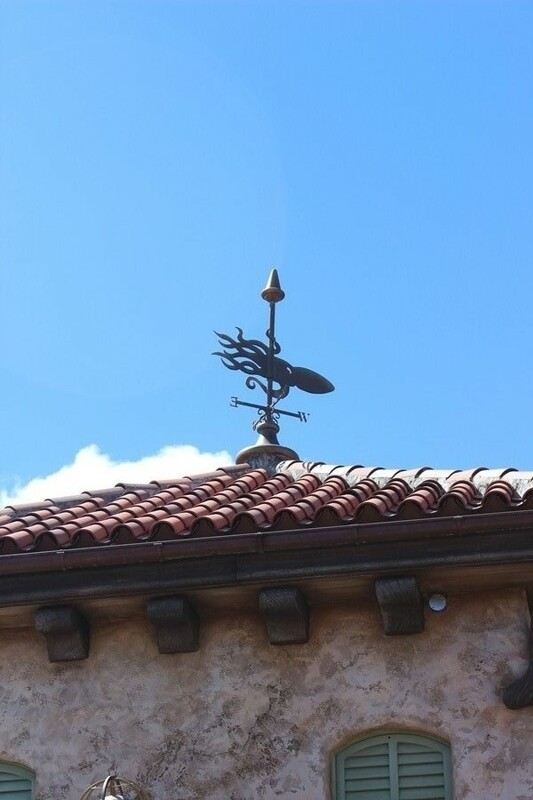 It is a silhouette of that squid that clutches to the weathervane atop Goff’s place. In case you’re trying to tie up all of the loose threads, Goff had at one point in time been asked to create the storyboards for Walt Disney’s 20,000 Leagues Under the Sea. At the time, however, it was supposed to be an installment in the True-Life Adventure documentary series. Walt wasn’t precisely pleased with Goff’s interpretation of the Jules Verne novel instead of documentary storyboards he had been asked to create, but the incredible environments and designs Goff had created sold Walt on the feature film. Among Goff’s many notable accomplishments within the film, he was responsible for the scaly, sea serpent figure that would become known the world over as the Nautilus submarine. To put a nice bow on the name (H. Goff), adornment (squid weathervane), and the place (New Fantasyland), it is worth noting that the one time E ticket attraction, 20,000 Leagues Under the Sea Submarine Voyage, once dove beneath the waves, ice caps, and down to the very heart of Atlantis on this very spot in the Magic Kingdom. Those submarines, however, are a story for another day. Not a bad way to remember a legend who gave so much to the Disney world we all know and love today, huh? This is so interesting! I recently took a bunch of photos here for an upcoming blog post. I was just going to highlight the photos, and I had no idea of the backstory. When I post the photos, I will link to your piece, to share this history.